MATERIAL: 8 lb. 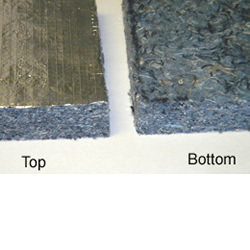 Bonded Acoustical Cotton (B.A.C.). Recyclable, Fiberglass Free. PATTERN: Soft Textured Surface, Foil FRK one side. FEATURES: Economical, Multi-Purpose, High Performance Absorption combined with STC value. Adhesively apply or hang as a baffle. APPLICATIONS: Gymnasiums, Auditoriums, Classrooms, Music Rooms, Arenas & Stadiums, Churches, Offices, Computer Rooms, Restaurants/Cafeterias, Residential, Concert Halls & Theaters, Pro Audio, Gun Ranges, Manufacturing Plants, Machine Enclosures, Water Treatment Plants.